Jess is now in the capable hands of Bill Allison and will soon be competing in the obedience world. Thanks so much to Bill for taking in this wonderful boy. 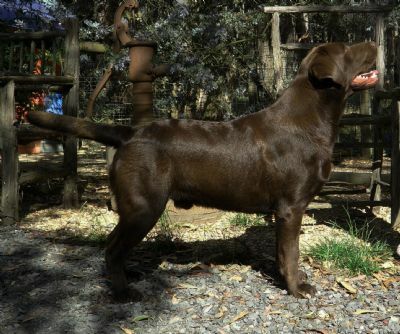 Jesse has his dad's sensible, steady nature, balanced conformation and his mum's retrieve drive, combined with their easy free movement; he displays all the traits I want in a labrador. His children are now making their mark too with multiple Baby, Minor, Puppy, Junior & BEST in Group awards! Jesse does it again! 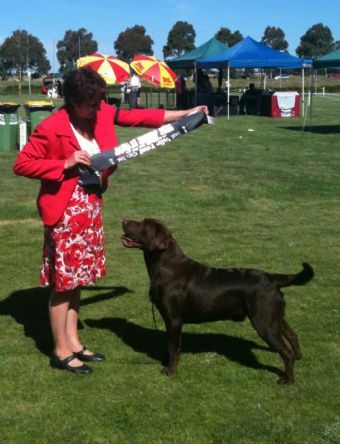 Winning Minor in Show and being shortlisted in the final 4 for dog challenge at less than 7 months old under breeder judge Mrs Margaret Brown of Ramsayville Labradors (UK) at the Labrador Retriever Club of SA Inc show. 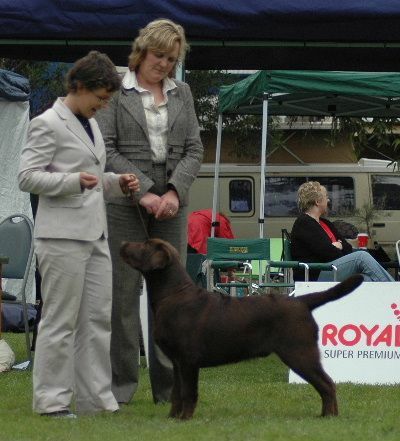 "I thought that this young chocolate was so well balanced, strong clean neck with long sloping shoulders, first class front angulation, lovely feet, feel that this is one that has so much potential, is so unexaggerated with little to improve on, firm topline and superb double coat, is sufficiently angulated in quarters to give him overall balance in outline and on the move, a superb young prospect, I wish him well." On top of that, Jesse won best gait under Mr Andrew Brown of Ramsayville Labradors - a huge accomplishment for such a young dog from a very large entry!